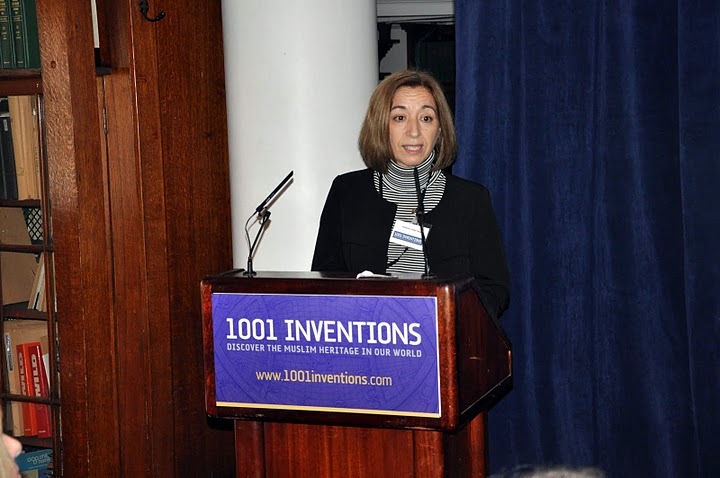 Figure 1-2: Professor Emilia Calvo presenting her lecture in the "1001 Inventions" conference. © FSTC 2010. 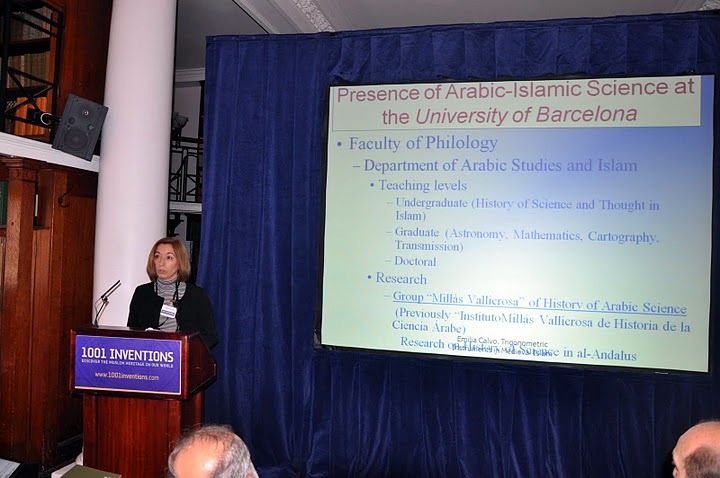 The aim of this presentation is to give an overview of the activities of teaching and research on Arabic-Islamic Science carried out at the Department of Arabic Studies of the University of Barcelona (UB). These activities have been developed during the past eighty years without interruption and were mainly done by professors of the Faculty of Philology of this University since the group of research was created at the Department of Arabic Studies. From the forties onwards, there have been at this Department studies in Arabic–Islamic sciences both at undergraduate and graduate levels. Nowadays, this discipline is taught in a very general way at the undergraduate level, basically as History of Science and Thought in Islam and there are more specific topics dealing with astronomy (such as astronomical instruments, astronomical tables), mathematics (such as trigonometry, mainly related to astronomical calculations), cartography and also transmission of Arabic science, at the master degree. Some of our students engage in doctoral researches and, after a period of training, they become members of our Group "Millàs Vallicrosa" of History of Arabic Science" doing research mainly on history of exact sciences in al-Andalus. Traditionally, we consider that the first step of the history of our group was taken by José Maria Millàs Vallicrosa as early as 1931. He was then Professor at the Department of Semitic Philology in Barcelona University and he published under the title Assaig d'història de les idees físiques i matemàtiques a la Catalunya medieval (Essay on the History of the Physical and Mathematical Ideas in Medieval Catalonia) his research on several 10th-century Latin works in astronomy, mathematics and gnomonics that had been compiled in what is now Catalonia, in the north of Spain. His study showed, without any doubt, the Arabic roots of the texts studied. This was the first of many other works published by Millàs Vallicrosa on different Arabic texts from different scientific fields, dealing with astronomical instruments, agronomy, navigation and many others. He also opened some other fields to further studies. Millàs Vallicrosa had a disciple of great ability in the person of Professor Juan Vernet, who was interested in all aspects of Arabic studies, such as literature (for instance, he published a Spanish translation of the 1001 Nights), Islamic studies (including a Spanish translation of the Quran) and others, but particularly in astronomy and mathematics in Islam. In fact, his doctoral dissertation was a study on Ibn al-Banna's astronomical tables. It was published with the title Contribución al estudio de la labor astronómica de Ibn al-Banna' (Tetuan, 1952). The result of these years doing research on scientific topics and the relationship with other researchers around the world, as well as with the International Union of History of Science, was the mandate to organise the 9th International Congress on History of Science that was held in Madrid and Barcelona in 1959. It was organised by Millàs Vallicrosa and Vernet and they published the proceedings of the Congress the following year. Among all the books, articles and contributions of Professor Vernet, perhaps the most well known is his book La cultura Hispanoárabe en Oriente y Occidente. It was published in 1978 and translated afterwards into German, French, Italian and Arabic. It saw a new Spanish edition in 1999 with a new title: Lo que Europa debe al Islam de España (What Europe Owes to Spanish Islam). Professor Vernet had a group of disciples who followed his line of research in Arabic-Islamic science. Among them the most prominent was Julio Samsó. Although he was interested in politics, law in Islam and Arabic literature (he made a Spanish translation of some tales from the 1001 Nights), he has worked mainly on scientific texts. One of his first works in this field was his doctoral dissertation research devoted to Abu Nasr Mansur Ibn 'Iraq's mathematical works. As a group, we have launched a number of research projects. The first project was carried out between 1980 and 1983. The main topic was "The Study of the Astronomy of King Alfonso 10th the Wise, its Arabic Sources and its Influence in Europe". It was sponsored by the Spanish Ministry of Education under the direction of J. Vernet and J. Samsó. It was continued by a new project from 1984 to 1987 on the same general topic. Directed by Samsó: 1988-1991, 1992-1995, 1996-1999 and 2000-2003. Directed by R. Puig: 2004-2007. Directed by M. Comes: 2004-2007 and 2008-2011 (now directed by M. Rius). Directed by M. Forcada: 2008-2011. The main result of the research done during these years has been a huge amount of new knowledge of the astronomical, mathematical (and scientific in general) activities developed in Islam, especially in al-Andalus. This allowed the Group to organize an Exhibition on Medieval Scientific Instruments in Santa Cruz de la Palma (June-July 1985) to celebrate the Opening of the Astronomical Observatories of Teide and Roque de los Muchachos (in the Canary Islands). The catalogue of the exhibition included some detailed monographic studies together with the photographs of the pieces exhibited. The main fields of research of this new generation, as it can be seen by their doctoral dissertations, were astronomical instruments (equatorial and universal plates) and anwa'. In 1988, E.S. Kennedy, D. King and J. Samsó, proposed the creation of a Commission inside the International Union of the History and Philosophy of Science to make this field of research more visible inside the community of historians of science. The result was the creation of a commission which is now known as The International Commission on the History of Science and Technology in Islamic Societies (CHSTIS). The presidents of CHSTIS were respectively E. S. Kennedy (1989-1993), S. M. Razaullah Ansari (1993-1997), J. Samsó (1997-2001), G. A. Russell(((2001-2005), F. J. Ragep (2005-2009), M. Comes (2009-2010) and J. P. Hogendijk (2010-). As a consequence of the increasing research activities of the Group, Samsó's general study on the history of science in al-Andalus was published in 1992 with the title Las Ciencias de los antiguos en al-Andalus. It constituted a state of the art, including all the achievements in that field up to that moment. A revised version of this study will be published in 2011. Also in 1992 an Exhibition took place in Madrid (Museo Arqueológico Nacional). It was organised by J. Vernet, J. Samsó and M. Comes with the title El Legado Científico Andalusi (The Scientific Legacy of al-Andalus). The catalogue of the exhibition, with the same title as the exhibition, included along with the description and photographs of the objects exhibited, monographic studies on topics related to the history of science in Islam written by scholars such as A. Djebbar, D. King, J. North, as well as most of the members of the Barcelona Team. "It is not well known that our modern science owes a great deal to al-Andalus, one of the most brilliant moments of our history, which created a science that, in the 11th century, was completely innovative." "This exhibition aims at recovering the historical memory and showing that the scientific level reached allowed the development of navigation techniques that, in turn, allowed the great navigations into the Atlantic." "The aim of the exhibition is to highlight the more innovative aspects of the Andalusi science like astronomy and medicine as well as the translations from Arabic into Latin and into Old Castillian." "It represents the willingness of creating a scientific community without frontiers. The spirit of al-Andalus can be an example to project the universalism of knowledge into the future." This same year 1992, Dr. Juan Vernet was awarded the Sarton Medal, recognizing his great contribution as a researcher in this field. The aforementioned exhibition was so well received that between 1993 and 1995 some partial exhibitions with many photographic panels, together with some of the objects exhibited there, were brought to several cities in the North of Africa and the South of Spain, one of them in Ronda (April-July 1995). In the introduction to the catalogue The Scientific Legacy of al-Andalus, Samsó reviewed some of the aims of these exhibitions, such as the reconstruction of objects from the descriptions found in scientific texts. Thus, some pieces of technology described in Arabic manuscripts but not physically preserved were reconstructed and included in these exhibitions together with explanations of their working and functions. At the end of the introduction of the Ronda Exhibition Catalogue, Samsó quoted the words of a historian of al-Andalus, Sanchez Albornoz (distorted on purpose) saying that "if the Arabs would have not invaded the Iberian peninsula, Spain would have not discovered America." At the beginning of the nineties, a new generation of researchers on Arabic-Islamic science was incorporated to the group. Some of them are still active and are now professors at our Department: M. Rius (now the President of the Catalan Society of History of Science), J. Casulleras (now secretary of the C.H.A.M.A.) and M. Díaz-Fajardo. Their fields of research (as can be seen in their doctoral dissertations, two of which are published, and the third soon will be) were the Qibla and mathematical astrology. In August 1993, the XIXth International Congress of History of Science was held in Saragossa. It was organised by M. Hormigón, the president of the Spanish Association of History of Science at that time. One of the symposia at this congress was organised by E.S. Kennedy and J. Samsó and had as its topic the transmission of Arabic science. The proceedings of the symposium were published in 1996 by the Group in honour of Prof. J. Vernet (edited by J. Samsó & J. Casulleras). This book was honoured by the Ministry of Cultures of Iran in 1997 as "Book of the year". Meanwhile, the Académie Internationale d'Histoire des Sciences awarded the Alexandre Koyré medal of 1995 to "Vernet, Samsó et sodales Scientia in al-Andalus Historia". In 2000 the first issue of SUHAYL (International Journal for the History of the Exact and Natural Sciences in Islamic Civilisation) was published by the Millàs Group. It is published annually and includes papers on exact and natural sciences from scholars around the world. In 2009, the assembly of the CHSTIS held in Budapest during the XXIIIth International Congress of History of Science and Technology agreed that Suhayl would be published in collaboration with the Commission. In 2008, the proceedings of the congress were published in homage to Professor J. M. Millàs Vallicrosa. In 2009, during the XXIIIth International Congress of History of Science, one of the members of our group, Professor M. Comes, was elected president of the CHSTIS. She had been previously elected secretary (2001-2005) and vice-president (2005-2009) of this Commission. "One of the goals of our Commission is the need to increase the visibility of our field. Building on our activities in the past terms, during which the Commission sponsored several important meetings in addition to the symposia under the framework of the International Congresses of History of Science, I am delighted to say that a number of panels will be organized by members of the Commission at the Third World Congress for Middle Eastern Studies (WOCMES) to be held in Barcelona, from 19th to 24th July, 2010." The 3rd World Congress for Middle Eastern Studies was held in Barcelona (University Autonoma of Barcelona from the 19th to the 24th July, 2010. Five Panels on scientific culture were scheduled, three of them dealing with Islamic science. They were organised by CHSTIS, although, in fact, most of the organisers are also members of the "Group Millàs". These panels were held in homage to the late Professor M. Comes. A new generation of researchers on Arabic-Islamic science is now starting its training. Between its members, we have M. Oliveras, M. J. Parra, T. Loinaz and E. Romo. They are now doing research on the history of Arabic science and preparing their doctoral dissertations under the direction of members of the "Group Millàs". Two of them presented the first results of their research at the WOCMES. During the past eight decades, five generations of scholars working at the Department of Arabic-Islamic Studies (Faculty of Philology, University of Barcelona) have devoted their efforts in order to bring to light and to explain this scientific legacy. Now several Spanish universities have included Arabic-Islamic studies and the Islamic scientific legacy among their disciplines. The relationships between the "Group Millàs" and other groups and scholars from other countries doing research in the same fields have grown wider and deeper during this time and some joint projects have been developed. The research carried out by the Group has contributed to a better knowledge of the extent reached by the different aspects of science in Islam, especially in al-Andalus. As a result, scientists like Ibn al-Zarqalluh, Ibn Mu'adh, Maslama, as well as their achievements, are now better known. Undergraduate and graduate students of our Department know more of this legacy and, in a more specific way, in what refers to astronomy and mathematics. There is a new generation of young researchers who have previously been our students at graduate level and who may guarantee the continuity of our Group. They represent the future but they are also a promising present.